For this game, Kevin Huerter is still listed as questionable with nagging neck injury. Jeremy Lin should be ready to play. Kevin Huerter (sore neck) is questionable. Kent Bazemore (right ankle sprain) is out. Miles Plumlee (left knee pain) is out. On the trade news, there are no new Lin news yet but Kent Bazemore was mentioned as the most likeliest one player to trade. Houston was linked to one with interest. This podcast ended with Nate asking Chris for one player most likely to be traded, in the entire league, between now and the deadline. klay thompson 44 points 44 points assisted on. this goes to a more to me mind blowing stat i have seen reported multiple places but can’t confirm that in his last four games harden has scored 200 points 0 assisted on!!!!! how is that possible? what does this mean? is this the “new wave” in the nba? are we taking kobe’s “give me the ball and get out of the way” to new heights? harden has more “iso” plays this season by himself than any other nba team full roster!!!! is that a rhetorical question? I’m not sure about Harden’s ISO stats .. but if it’s true 37pts unassisted vs Klay’s 44pts assisted, it will only mean a quick exit in the playoff when defense is tougher. I saw a tweet with good stats on whether 2-stars should stagger or not, and I see Harden and CP3 seems to be performing better net Rating individually when not paired together on court . I’ll post it later if I find it again. Hope Lin is still moved but there were a few Hawks fan who thought there’s a small chance Schling may keep Lin for the entire season and simply let him leave because he doesn’t want to add any extra money or even an extra player that will need to get minutes..They already like the players they currently have. I don’t like the “latest Hawks trade rumors” without Lin a bit! According to basketball-reference, James Harden has scored 200 points and has 17 assists over the last 4 games. His total +/- for those games is +5. to clarify im not saying harden didn’t have any assists im saying NONE OF HIS POINTS WERE ASSISTED. to me that seems insane. 200 unassisted points. Jeremy, have a great game tonight! The +5 is proof that Morey will never fully comprehend about team play. The natural effect of a single player taking all the shots while teammates stand around leads to atrophy of skills that will be necessary when playoff defences tightens up. Morey has not changed his mind either. He doubled down on the 2 stars and got rid of key players that helped them almost beat the GSW. That lead to a bad start to this season and Make the Rox not a real contender this year. You may be right here. They are probably not getting the offer they expected for Lin. They want a first round pick but team don’t want to hand over a first rounder for a 30 year old PG who could leave this summer..and I don’t blame them. In my opinion Lin’s most valuable statistic was his 40% 3point shooting but that has vanished lately and I think teams are now a bit lukewarm about giving much for Lin. If Hawks wants to boost Lin status, they should start him and let him shoot at least 15 time a game. Hi. Here’s a recent article that describes Harden’s style of play. It lends credence to your comments. There are tweets repeating the “200 unassisted points number in 4 games” but none that I could find from a reputable source. That is so..how should I put it, such staggering information. Wow start of a SEVEN game round trip, that has to be some sort of record — but JLIN has no need to get too familair with the city of Atlanta anyways, since we are moving on to a new team soon. The role of Lin in this team is questionable; is he just a decoy in offense and a defensive player. Does he even touch the ball, when or just before the shot clock expires? When Lin was horrible in stats, Lloyd Pierce usually gave him the lots of minutes. bad pass by Trae through traffic. the easiest way to get assist is to dump the ball inside to Collins. Great patience by Lin to get closer to the rim. “boy poor jeremey lins taking a beating” says veteran bulls announcer neil funk. Those falls can make his back strain worse and cause future injuries. Falling or not doesn’t matter, refs used to cheat Lin’s fouls no matter what it was. One turnover and Lin was pulled. Short leash for the babysitter, “stabilizer” veteran. LP is going to design a play. Tank commander only sees Trae as their PG. Remember how he said at the beginning of the season. Lin didn’t do too much just passed and how they lose their main PG when Trae is resting. Going to tune out, let me know when Lin comes in. It was only 1 TO and Lin was on fire, he deserved to stay in! Think so? But his knees might get hit when hitting the floor still dangerous either way. The could be the reason he was pulled! The irony! They better trade Lin soon. Can’t stand this. So what do pacers have?.. Oladipo is done for the year and they are in the playoffs. After Lin sat, the Bulls went on 19-7 run in the last 3:46 to make it 60-66! trae is learning the splitting 2 player dribble now..
Why is Prince blocking Lin on that baseline drive? Shut up LP, quit telling Lin what to do, when you let Trae do anything he wants. haha. Trophy for you for being a loyal Lin fan since ? (2012)! I am grateful that we could share our frustration and excitement as Lin fans here! Lin played too well to get more minutes. i don’t see that it is LP’s basis for him to play Lin more..Garbage time is one when he will play more, or if LP wants to win (but give the last minutes to TY for him to say TY wins it for them) or when team has lots of injured players..(to all you can add some on this, but i believe playing great is NOT a Basis and will never be for LP! Exactly bias refs are cheating Lin’s fouls again! No way was that a charge against Chandler! Smart Lin play to get a high-off the glass layup knowing RLopez tried to block it. Nice cross-court assist by Trae to a wide-open JLin! 3333!! That’s 15 minutes for JLIN — if this lead holds up perhaps JLIN doesn’t see any more time in Q4. 2 of 3 three pointers so far!! What do you know, Lin gave up the open 3, made the extra pass to create a great open 3 for Trae and Trae paid him back by creating an open 3 for Lin before end of 3rd quarter. That was beautiful basketball, and Trae does make great passes but he isn’t a starter nor someone you’d want to build around. lin is hot and LP is like you need to sit J.
led again blossom to 15 when he’s out, so TY gets his experience! Lin was going to come out if not for shooting those FTs. He lucked out and those few extra minutes got him a 3 pointer with Trae repaying him for his 1st made FG and 3 pointer of the night. Trae usually ices him put and play 3 man ball with Collins and Heurter so that was nice to see. On other news, Nets won over Magic 114-110. All out development now with Lin on his way out. Vince was just an excuse for tanking. Really hope Lin gets trade to a team where he can start and play his game! With Cliff as coach of Magics I’m not sure Lin will get the start. LP want to win tonite, that’s why Lin plays MORE! great cross-court assist to Prince 3 on the corner! dam man the nets are just lucky.. maybe it’s their lucky year.. orlando teammate helped them score to win the basket. oh my goodness. 7 staright wins at home, sixth seed 26-23 record.. MAN. and the nets were suppose to get beaten on the inside by the magic’s backman since the nets mostly guards..but they still beat them. Neither did Prince on the previous play with Lin ahead with a clear open lane to the rim. agree, but glad Lin getting his stats. You sound like a Nets team reporter AGAIN! they have the chance when TY was playing..why not let him play more if LP is not keen on winning tonight? HAHAHAH.. no.. I feel bitter still. wow, Oladipo went down without contact and might be out of the season. I love watching Lin and Len play off each other. 4th assist for the Len dunk! Stabilizer veteran’s job is done! Great stat line by Lin tonight. He player very composed and teammates actually passed the ball back to him even when Trae was in. Lin had that crazy fall going against Robin Lopez to draw the foul, so glad he’s falling properly but need to avoid those reckless plays. why is Bobby Portis shoving Len with 11 seconds left and 20pts behind? Remember PBev once interfere with someone taking free throw? In the chuckerville when players play 40mins and take 30 shots 12 is nothing. Not to mention you can’t get out of slump without shooting. Like what Lin said earlier he’s changed his mind about shooting. He’s not looking at whether it goes in but the quality of the shots. It’s exact what’s needed to be a star. Can’t say the same for Trae but taking many shots and missing isn’t necessarily bad if the look and quality are there. Stop shooting just cause you’re off, what Lin used to do, is far worst because that’s when you give up open looks and lose confidence. Yes and Lopez had the nerve to be mad that fall could’ve injured Lin. lenlin – they can start a lending company ahahah so corny. Lin and Len have great chemistry wish they started together for another team. winner tonight is the real loser! John Collins is impressive, 14-16 shooting on his way to a career-high 35 points with 8 rebs and 2 assists. On that play, lin could have lopped the ball to len for a dunk and avoid any potential for injury from the big. Seems like only a matter of time before his luck runs out. The next Lin audition is in 3 days vs. Portland Blazers. Dlo took 21 shots to make 25 pts. Woopidoo. The box score showed the second unit has the real starters with more minutes. Anyone that thinks Dlo is dlosanity is just insanity. ooppps, i click the like button, not minding i might be misunderstood that i liked the injury with olapido (joke) …lol, nobody likes being injured and fans doesn’t wish for ill will among all players (some do i guess), but this kind opens up opportunity that some players do have short of at the moment! I watched the game and VanVleet was 5-14 for an amazing 14pts. As a team, they shot 30.8%. McCaw took 1 shot for zero points in 12 minutes. Lin would have won it for them. Health is once again proven as the #1 asset of an NBA player. This is exactly why Lin needs to take more shots, fans don’t look at how many they took just the points made and are easily impressed. That’s probably true. Need to shine up the lemon before selling it. “Social media is so congested with stans that just last month, someone on Reddit changed the lyrics of Eminem’s song as if it were a letter to Kobe from an obsessed fan (“Dear Kobe, I wrote you but you still ain’t callin / I left my cell, my Insta and my AAU team at the bottom / I sent two tweets back in autumn, you must not-a got’em…”). Here is data for Jeremy that shows the percentage of 2-point and 3-point made field goals that were ‘assisted’ and ‘unassisted’ (from the NBA web site). I segregated the data from his year with Golden State and his second year with Brooklyn. His year with the Knicks stands out. 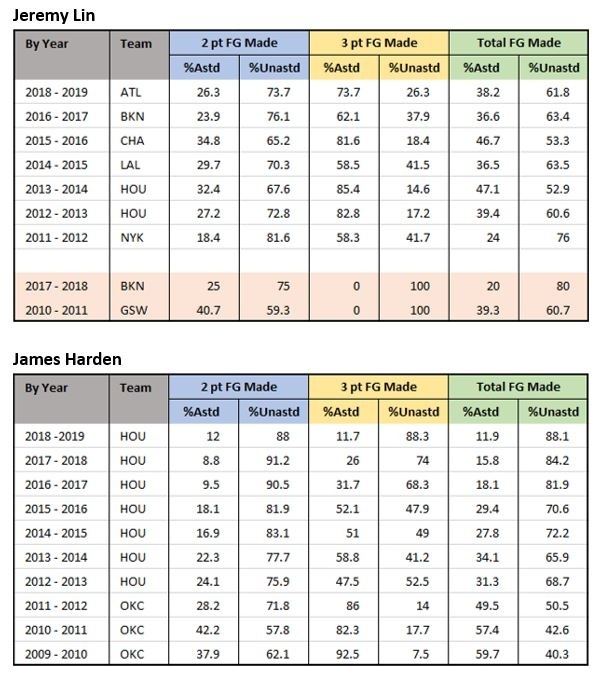 The data for Harden shows how ‘unusual’ his playing style has become in recent years. Now, 90% of his made field goals (2-point and 3-point) are ‘unassisted.’ Click to enlarge the table. Howard Megdal. A Lin fan at heart, just like the rest of us here. He just has bigger stage. LOL. He makes a convincing case for Lin going to Orlando. Clear and simple. This should make the “Trade JLIN” fans happy. Will Orlando finally bite? Will Atlanta be willing to let Lin go for these assets? It would also be interesting to see how much Lin scores off screens set for him. I don’t think screens count as assists. Quick general take on these stats. Lin can still drive for layups, or shoot mid-rangers off the dribble without help. But, I think JLin just plays much more of a team-oriented type of basketball. Much more fun for me to watch. So glad he’s out of Houston. Hope y’all that wants to see Lin back with D’Antoni can please give it up. NOT WITH MOREY AND HARDEN still there. And with CP still there. I love humor. That is great! Like your response too! Defending us Lin fans, AND giving props to Hawks fans and Hornets fans. We are NOT all delusional or crazy. In fact, I think MOST of us are very intelligent and perceptive. Just very dedicated and LOYAL. And extra-protective of him because all the adversity he has faced in his BBall career. Aren’t most fans of a player or a team? No different. What Cliffy said about the Magic’s weakness to draw fouls and getting to the point might as well be a code word for JLin 🙂 Howard really makes a good case for Magic to test Lin for 3 months to see if there is a good fit to resign him in the summer. The problem could be the trade scenario since we know the Hawks want 1st round pick, not simply the expiring contracts. “Our issues have been drawing fouls and getting the ball going into the paint,” Clifford told reporters in Brooklyn Wednesday night, prior to Orlando’s 114-110 loss to the Nets. He’s not wrong. The Magic are at the bottom of the NBA in free throws attempted, a missed opportunity for a Magic roster in the upper half of free throw accuracy. They are also in the bottom half of the league in twos attempted and made. D.J. Augustin and Jerian Grant have posted assist percentages of 25.3 and 22.9, respectively. Augustin is an elite three-point shooter, at 43.5 percent this year, meaning he could help the Magic off the ball. It is a situation that cries out for Lin, who is most effective as a ball-dominant point guard operating out of the pick-and-roll. The number of easy baskets the Magic would produce with Lin feeding Gordon, Isaac and Bamba will not only improve Orlando’s efficiency now, it will give a vital confidence boost to three players central to whatever Orlando is planning long-term. And if there’s a fit, Lin will be available this summer via free agency, giving Orlando a leg up on making the case to him that the Magic Kingdom is the place for him to settle down and spend his 30s after a tumultuous 20s. The Hawks, for their part, need at least someone to soak up point guard minutes. The results are less vital (Zion Williamson isn’t going to draft himself) than the significance of limiting the wear and tear on Trae Young over the season’s final few months. So they need someone at point guard to pair with him. My suggestion: Terrence Ross and Jerian Grant to Atlanta, a pair of expiring contracts between them, for Jeremy Lin. Everybody wins in this scenario. The Hawks have a Trae Young backup. The Magic can see what this roster looks like with a point guard built to maximize their most vital long-term assets, and maybe even make a playoff run in the process. And Jeremy Lin can show the league he can start, and thrive in the role, ahead of his next big free agent decision, while playing for a coach, in Steve Clifford, who loves him. There are plenty of other teams who could use Jeremy Lin — I’m looking at you, Phoenix. But the Magic make too much sense for these two teams not to get together on a Lin deal. See Howard Megdal’s article from today! Megdal agrees about Magic! But we can still hope. Because we know that Lin will be BIG DIFFERENCE MAKER. 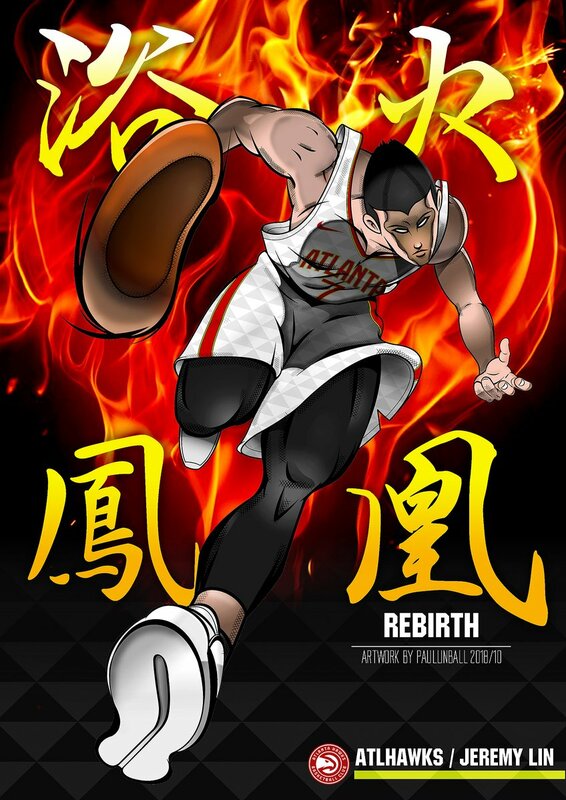 you’re welcome 🙂 IMHO it’s very important to acknowledge the good things the ATL media and most fans have appreciated JLin; it shouldn’t be taken for granted since we know other Lin’s ex-team media and fans can be horrible to JLin and his fans. Being nice can go a long way to create good relationship. Pretty good suggestion if Haws couldn’t trade Lin for pick then it may be possible because I guess they retain the bird right plus cheaper future contracts for the couple younger players they traded for. Nets Injury streak continues – possible season ender for Spencer Dinwiddie now. We are in a bit of a catch-22 with JLIN drawing fouls, some fans hate to see JLIN take impact fouls but to get the the foul line frequently, you will have to take some hits. Could a thumb injury be so serious?..I remember seeing player tapping up their thump and play through it…or maybe that’s his shooting hand thumb? If it wasn’t the thumb he could probably make do, but you need your thumb to do anything in basketball. 1) I might remind everyone that JLIN has lived on or close to the East coast for 4 years – so JLIN certainly would love a change back West if there is a chance. It’s curious that JLin tweeted ‘West Coast as Best Coast”. Could it be a signal to his fans that there’s possibility of a trade to a new team in the West Coast? Or is it just a harmless tweet? There are 5 teams in this upcoming roadtrip. Could it be Blazers or Kings? Or even the Suns? TRoss salary is $10.5M expiring and Jerian Grant’s roughly $3.5M until 2019-20. It may work if ATL wants to use Bird rights to resign them. At least Grant can backup Trae. But if ATL prefers 1st round pick in 2019 or 2020, ORL offer might not be as appealing. Do we know for a fact that Jlin’s camp told Schenk that” under no conditions he remain in ATL”? He has no leverage, what can he do? Lot of people accept as fact that Clifford likes Jlin. He may like him but I don’t know that he would like him well enough to start him, give him major minutes, or let him be ball dominant PG and play his game of PnR. If he did those things, I would forgive Clifford for the way he wasted Jlin in CHA. Speaking of CHA, MJ and Kemba seem to have a love affair going and that it is a forgone conclusion that MJ will play Kemba big bucks to remain in CHA. I predict Kemba will be Batum #2. Big contract not worth the money. The quote by Clifford seemed to clearly suggest he wants Lin and that may be a message to their front office to get Lin but of course the FO don’t want to give up good young asset or a first rounder for Lin who could be a free agent this summer. I think they are probably holding out and hoping the asking price for Lin will drop as we get closer. The Magic probably know by now the Hawks are having trouble convincing anyone to give up good young assets for Lin. I would think Cliff could just to the FO and say “I want Jlin” rather than make a public statement and drive up the price. TOR is my first choice, but if Jlin went to ORL and they did not have to give up Vucevic then there may be a surprise potential there, but only if they let Jlin be the ball dominant PG and play the PnR when and how he sees fit. I don’t recall the Cliff is big on him being ball dominant and playing PnR except for Cleveland and SAS when he must have fallen asleep or lost control. time for an enhanced up date on currently active undrafted players in the nba. anyway the staggering thing to me isn’t that lin is #1; but how few undrafted there are doing anything in the nba. out of 450 players only 16 undrafted (a little more than 3 %) make the cut of 3 seasons, min bop and min bop plus per. And some day we will add Yuta Watanabe to this list. Another unfairly treated Asian players. I can understand for average and thins players but dude is 6’9” and so much more versatile than Jared Jackson their new franchise who isn’t going to garner any attention or interest what so ever. All I have to say is, IM SO GLAD Lin is off this injury inducing trainwreck! Want your career to end? Go to Nets. Hawks wouldn’t have sl much trouble if they started Lin and gave him 30+ mins! Lin only playing 15-20mins per game isn’t going to get them the most assets. Jeremy finished with 449,000 votes in the NBA All Star fan voting. He was in 9th place among Eastern conference guards. Goran Dragic was in 8th place. He got no votes from other players or the media. Doesn’t matter, Doncic was no.2 in votes behind LBJ and still didn’t get the start. Doncic’s only luck would be coach voting. The change to not allow fans determine who becomes allstar makes the entire process rigged. Raptors have Valentunis on the sidelines with a wrecked thumb since early mid December. so dlo thinks he ‘owns’ the team now. he is thinking yes. I’m sole person who survive..they need me now, I can do anything. blah. His IG live feed actually had “Wheels Up” It’s almost like he flying to his new team already. cliff probably doesn’t have the backbone to go to FO and say that..
remember.. he has to listen to the FO and jordan in the hornets and play batum. Exactly…They seem to want way too much for a player they’re only playing 20mpg. And of course, Lin will be a free agent this summer, so the Hawks are ridiculous. Hope JLin can negotiate a meaningful contract. NBA may not even be the best choice. I personally think NBA is mighty sick. Doubt it, Lin always drops hints and with the deadline so close it’s almost certain he’s going to a western conference team. I’m sure it will be a surprise. JLin is on the top left (~8 passing boost), quite an efficient passer with high passing boost. Note: For Westbrook, his assists are based on volume. The Thunder shoot better off non-Westbrook passes than off passes he throws. Interestingly, Trae is similar to Westbrook. “Which players best elevate their teammates’ shooting with their passing? It’s TOTALLY RIGGED. We knew who would win. AGREE WITH YOUR POST BELOW. Sad to say, I don’t think JLIN will ever become an all-star either. The system is rigged against him. Players votes? What happened to all the “great” teammates that Lin has had? Not even ONE vote? Meanwhile, Jaylen Adams and Daniel Hamilton got player votes. Not that I begrudge those guys. Just that the player votes are totally MEANINGLESS. Meanwhile, the media? They all cite stats to support the predictable winners. If they’re going to use STATS, why bother asking fans to vote? And then the coaches get to pick the reserves? Why not just the fan rankings? The hypocrisy of asking fans to vote for their “favorite” players. Only to nullify the votes with players and media and coaches. What a SCAM. This is why I was hoping more Lin fans would step up and vote for him. JUST TO SHOW THE NBA THAT LIN FANS CAN’T BE PUSHED AROUND. All-Star game in Charlotte this year. Coincidence? The NBA is such a joke. Endless preaching about playing unselfishly, sharing the ball, playing as a team, it’s a team sport. Meanwhile, the biggest ball hoggers, the most selfish scorers, get glorified. And get all the accolades and all the money. The funny thing is, GSW is probably the least selfish team, relatively speaking. AND THEY WIN! Every team wants to copy them, but yet continues to reward those who only play for their own personal stats. Given such low minutes compared to the other players here, surprising that Lin even made the cut of 100+. Certainly not all assists are created equal. I’m not sure I follow though. How is a “potential” assist measured for “shoots better”? I guess if the same metric is used, then it’s interesting to look at “relativity”. In addition to Westbrook, Trae Young is even closer to Harden and Lillard. All dominant and high usage. Yikes! JLin is closer to some BIGS who are known to be good passers. MJ already gave Kemba big bucks with Jordan shoes. Kemba is very popular and fan favorite in Charlotte. Salaries wise, it’s actually unbelievable that he’s only been getting $12M since 2015. Batum, Marvin Williams, Cody Zeller, Biyombo, and MKG all make more than Kemba. At least MJ is being a loyal owner to a guy he drafted. UNLIKE OTHER OWNERS THAT LIN HAS KNOWN. But let’s see what happens when it’s REALLY time to put up the money. That’s why Clyde Drexler had full freedom to criticize Lin. He worked for the Rockets. Probably ordered by Morey. Unlike, the more independent broadcasters. Such as YES Network for the Nets. Or Fox Sports for the Hornets or the Hawks. Although I’m confused by Dominique Wilkins’ role. Lin clean block, called as foul Lin fans confirming unfairness to Lin via Ronnie Nunn. AGAIN, AS USUAL! Lin doesn’t get the benefit of the whistle. Lin pregame handshake with John Collins. The game in Portland vs Trailblazers. Postgame, JLin joining Eugene Cho with One Day’s Wages. One more trade speculation for the road. From Harvey Araton, in response to Howard Megdal’s article re Lin and Orlando. Araton thinks it should be the Spurs. We Lin fans have been through all that about the Spurs. Popovich has seen, first hand, how many times Lin has rolled over the Spurs. If he had ever wanted Lin, he would have gotten him YEARS AGO, so that there would be smoother transition when Parker and Ginobili started getting old. So, NO, I don’t think there is ANY interest from the Spurs. Really love this new analytics. Now it’s fact that Linsanity was no fluke. The fact that the Knicks instantly played well together is why Lin has made everyone around him better. Now the big question is can they find the analytics for why every team ignores that fact and chooses to attribute the good play to everyone else instead? Absolutely right. All these coaches agreed with Karl that Lin was the engine of the team, none ever tried to pick him up even at Vet-min. It wouldn’t surprise me that’s Clifford will also pass this time. Off topic, I watched the Raptors play the Kings and they have two bigs that would thrive with Lin. They could easily make the playoffs with Lin feeding them. The NBA plays for the entertainment value of its audience, and a large part of the audience are not sports fans, they are celebrity worshippers. Pro sports has been “developed” and “dumbed down” to this audience. If you are and older sports fan then you have seen this change developing over time. Now sports has also become a social media platform and a social justice cause platform featuring healthy athletes earning huge fees not for the sport but for entertainment. Are you entertained? I see air guitar closed by Naruto’s Fire Style Fireball Jutsu Hand Sign? Our friend Greg from Sportige addressed the pro & cons of Lin staying at ATL or going somewhere before Feb 7. I agree. Words are cheap but actions speak louder than words. We’ve seen Pop and George Karl praised Lin but when it comes to action, there’s none yet to recruit Lin. I think the fact that Lin can feed bigs easily will give him steady minutes in the playoff. Hope a team will be smart enough to Linvest in him! Potential Assist: A pass that leads directly to a possession event (shot, foul, turnover). In the twitter thread, there’s explanation that the % better is compared to the average of % potential assist for everyone in that team. So it means JLin’s passes has higher chance to turn into points more than his average teammates. It just confirms that if you put the ball in JLin’s hands, it has the highest % of turning into points compared to his teammates. Of course, there’s argument if the % will drop with higher volume but it still shows he’s the most effective assist-creator in the Hawks based on the current passes that he made in Dec 2018. My theory based on eye test is JLin likes to feed his big around the rim with nifty passes as he drives to the rim to draw defense so of course his bigs have higher % of scoring due to close proximity to the rim and Lin’s ability to draw the big’s defender to cover him. Trae might have lower % because of possibly risky (but flashy) passes, higher volume, more passes to 3pt shooter who has lower FG% than bigs around the rim. Very fascinating analytics indeed. It’s only for Dec 2018, I hope if there’s a full season one. Sorry for being so repetitive, every so often I feel it bears reiterating the scenario, feel free to disagree. b) More importantly if Schlenk/ATL accepts (a) that means on Feb 7 JLIN is worth perhaps a first round pick but on Feb 8 JLIN is worth ZERO$, because JLIN freely leaves to new contract. Schlenk repeatedly said he’s seeking trades before deadline. c) Two part GOAL: I don’t care whether JLIN STARTs or plays BENCH when traded (and suspect JLIN doesn’t either) because that is not the initial Goal of this trade — the goal is playoff contribution; the subsequent Goal is negotiate new contract perhaps to START for a new team. d) Any team trading for JLIN will be a playoff bound team needing extra PG help and will most certainly give JLIN more exposure, responsibility and minutes than staying on Pierce’s bench. I don’t have the exact statistics but I have heard that 90%+ of all trade activity takes place in the day before or day of the trade deadline with the remaining trades mostly situated on this year was Dec 15, day Ariza traded when new FA’s were first allowed to be traded. So most likely we will need to wait until Feb 6, 7th as desperation of both buyers & sellers take over. I agree with all your points. And Schlenk’s statement and source leak confirmed that Atlanta wants picks/assets by making Dedmon, Lin, Bazemore available. I think Greg’s article addresses the small % chance (<10%) of the benefit if for some reason Atlanta decides to keep him. Personally, I don't see it either. Atlanta would want to get 1st/2nd round pick fo Lin otherwise he walks away in the offseason. It's just common sense. Doesn’t matter if TY hits a wall. ATL will play him anyway. Just hope he stays healthy till after February 7. Detroit is among my top 5-6 destination for Lin.They recently lost Ish Smith through injury and they’re not happy with Reggie Jackson. wow, Blake Griffin’s face was NOT happy when Reggie Jackson interfered with his interview proving his point that his team lacked focus. You have to give props to Griffin for maintaining his cool during this moment, as he clearly did not appreciate Jackson’s antics. It happened literally seconds after Griffin ripped his team for not focusing in big moments and causing them to lose several close games. I have never understood the need and/or desire to play TY such heavy minutes from the beginning. Yes he is young but has an underdeveloped body. I really hope he stays healthy until February 7. It will be 2-4 years until he grows into his body. In the meantime he can study how to play defense. It’s all about the Rookie Of the Year (ROY) race with Luka Doncic that Luka has ran away completely. yes, Trae’s passing is his greatest asset. His shot selection and 3pt shooting will improve but defense will always be his Achilles heel being so undersized. Lack of height is a disadvantage in BB for sure. But with the spread offenses and people spaced out he does not have to contend as much in the crowded-with-tall-players. There are other short players who have figured out mentally how to make up for their “short” (pun intended) comings. Chris Paul, Kyle Lowry, old John Stockton play tenacious crowding defense. Watched some old John Stockton clips the other night and forgot how really really good he was. He was not tall, made a lot of assists because he was a ball dominant PG, much as TY is allowed to currently be. TY should study these “short” (pun again intended) successful stories. If he can’t learn to play decent defense then I don’t think he has a future in the NBA. He can’t let guys like Sacto guard Fox go off for 40 pts. Here’s an old video of Jeremy kidding around with Blake Griffin. I think it’s probably from the ‘Rising Stars’ game, held as part of All Star weekend, during the 2011-2012 season. Notice that Landry Fields is there, too. idk we can speculate such threat for coaches without seeing some examples. I don’t think it’s the case, though. Some just prefer younger prospect; or shoot-first PG or less risk/reward type PG. But this season, JLin has shown one of his best seasons as far as decision-making, being in control, patient in the court. I think that’s what makes a lot of team interested to trade for him. Very impressive after coming back from the torn patellar tendon injury that not many NBA players can come back from. He doesn’t even need to rely on his athleticism so much this season. Great news for Lin and his million of fans! Watching Toronto playing against Houston right now. They need Jeremy! Didn’t see game. But, Lowry & VanVleet totaled 5 for 18 tonight. Not exactly winning combination. Would have probably won if they shot better. Toronto lose 2 games straight, on the road. You’re right. @disqus_zDgJ5zJRLn:disqus is right. Toronto could use Lin’s help. OT – Another article with opinions on who are likely buyers and sellers and who will stand pat. “2019 NBA Trade Deadline Primer” – credibility of writer Bryan Toporek? Lin not mentioned here at all. Atlanta as likely seller, but nothing about Lin. Only about Bazemore and Dedmon. Yes, this was from the “Rising Stars” game! “Linbelievable!”, says Griffin. Since we are remembering that. Lin played only 8 mins in the game. His only assist was also a LOB to Griffin. Lin made it look easy. Hi Psalm. There’s a post waiting for approval. About Griffin. Maybe I used “banned” words? “it’s just common sense.” SIGH. There is no “common sense” with the NBA. So much bad management. That’s what all the pundits criticized the Knicks for letting Lin walk and getting nothing back for him. That’s what we all thought would protect Lin from being traded by the Nets until this February. Having said that, isn’t Lin’s expiring contract an asset too? Even if Atlanta gets nothing for him, they will still get back cap space next year. Add Terry Stotts (Blazers vs Rockets), Brett Brown (D’Antoni as Asst), Brad Stevens, and Eric Spoelstra (Heat vs Hornets). All said Lin was great. My theory is that NBA coaches generally have very little power. Maybe the championship winners have more. Or “icons” like Popovich, and now Kerr. They may be “consulted”, but are they decision-makers? When things go wrong, the coaches are the first ones to go. As the fall guys. The “stars” always win. Look at McHale vs Harden. (I am NO FAN of McHale. No sympathy for him being fired from Rockets.) D’Antoni vs Melo. Karl vs Boogie Cousins. The players are very creative. Lin is usually the ring-leader. I guess started from Landry Fields days. Thanks for taking the time to try and explain! “celebrity worshippers” – GOOD POINT! Always good NOT to see Lin on this list. Don’t watch any games except for Lin games. Sometimes, catch a few other teams’ highlights. Or last few minutes of games. Given potential Lin teams. Is it just me? Or do some teams never look like they are having any fun when they are playing. For example, OKC. Detroit or Miami. And forget the bottom tanking teams. At least the Hawks look like they are having fun. Or is this my Lin bias? I hate rebuilding teams like Atlanta. Players are being forced fed to certain so called championship stereotypes. In reality, young players are misused to pad their stats to earn the recognitions that they don’t deserve in order to justify moves of the FO. Warriors 2 is a bad joke. I hope Dallas will prove them wrong. I hope Denver can be more successful. I’ve followed raptors since Vince Carter on and off. So I watch some games on and off, more off when Casey was coach. With Kawhi and a better coach, I can see them at least getting to eastern finals. I guess I’m more invested than most Lin fans in hoping for a trade to Toronto. The fact is though that Masai didn’t try to get Lin even at Vet-min, however now he’s desperate. He took a huge gamble to trade away a fan favourite for Kawhi ho has publicly stated that he wants to go to LA. Masai May lose his job if he can’t get a title out of it. Lin may just save Masai’s job because no one else has Lin’s pedigree. No pressure in ATL to win. Why not smile? They won’t get traded for playing poorly. Can’t tell if they are giving 100% winning effort because…they don’t have to and in fact don’t want to win! Tanking taints every single conversation a person can have about professional sports. The video posted the other day about Blake Griffin’s glare when being interrupted during an interview about losing a game is the difference between when players are playing to win and not caring whether or not they win. OKC, Detroit, Miami, the teams you mention are all trying to make the playoffs, the players trying to keep their jobs. Not in ATL, though, things are just groovy! C’mon ATL, give fans 1/2 of there money back for a half-assed effort. Does productive dialog mean along the lines we see members of congress and the media engaging in? This is exactly what I thought Ledumb’s intentions were in LA: https://bleacherreport.com/articles/2817699-macmullan-lebron-james-camp-prefers-luke-walton-to-be-fired-as-lakers-hc He nicely separates himself from this coming controversy buy laying it off on his “advisors”. I would not be surprised at all if all the time he has taken off for his groin injury was manufactured to create a losing streak and put more pressure on replacing Walton. I don’t know if Walton is a good coach or not. I think he might have been lucky to be with GSW during their championship run then jumped to LAL head coach. We will probably never know. If I was Jeanie Buss I would beware of strangers bearing advice. Get rid of Ledumb now and build around your core. Get rid of Rondo too. Though I know nothing and this is pure speculation about Ledumb, for some reason I don’t think Magic is in on the palace coup. At least I hope not, I thought he had more character than that. Oh, and since this is a Jlin website, after you get rid of the poisons get Jlin back on the LAL. LeBron never liked non-black coach. I said this before that he would try to get rid of Walton and get a black coach, and it is coming. Good genes and maybe good PEDs. Your last sentence “Being descend et.” I don’t understand the “descend”. Did you mean something else? Got it, understood and agree. Saw in the news Kawhi bought a house in San Diego. Is this a “sign”? Still want Jlin to go to TOR to win a championship. After that he should be able to get a nice contract. Kawhi can go do what he wants. But for now Kawhi helps Jlin get a championship. BTW, FWIW, probably not much, I thought it in poor taste for him to buy a house just as TOR is trying to win a championship, clouding the discussion about the team. Descent? LBJ was never decent, cocky and despicable just like Kobe. Sheesh if he’s descent than KD, Curry, and Thompson must be angels! Uh oh, did not know there was a “banned words”. Where is this list? I hope “tanking” is not on this list otherwise what is there to discuss regarding ATL? I’m calling it now, LeBron and powers that be are trying to setup his future to be a candidate as a governor of CA. Gotta click on the link in Psalms post below to get to the Hawks vs Portland Blazers game thread. No items found in feed URL: http://news.google.com/news/section?cf=all≠d=us&q=Jeremy+Lin. You requested 6 items. Build a community to enjoy interaction and positive discussion among Jeremy Lin fans. Provide a place to link together social media and articles related to JLin.